It was a big day for 13 Action News and some teachers around Las Vegas. Good Morning Las Vegas anchors delivered school supplies to Keller Elementary School from our Supplies for Success donation drive. Beth Fisher and Yasmeen Hassan delivered to third grade teacher Miss Christina Carlson. She has been teaching for more than 15 years and was extremely appreciative of the donations. Dayna Roselli and Justin Bruce delivered to third grade teacher Miss Kristen Davis. She has been teaching for 14 years. "There's never enough pencils, never enough pens, markers are like gold," said Miss Davis. "Having the community come together like this and support our schools is greatly appreciated and our children are going to be the ones who benefit from this." 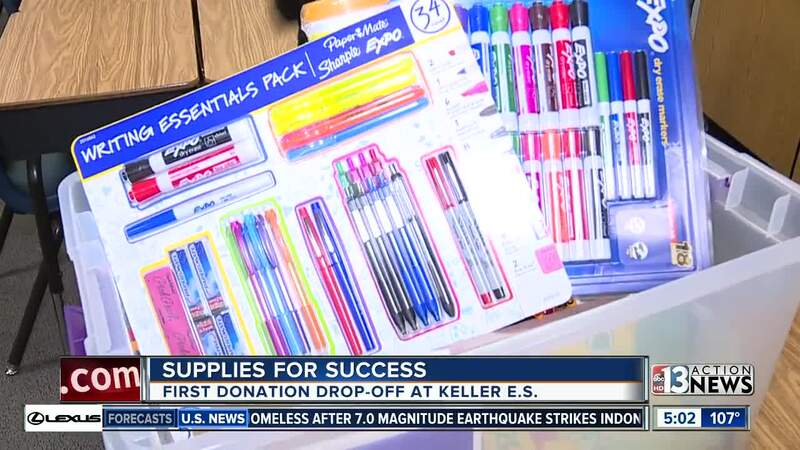 School supply deliveries will be made all week long to more teachers at Keller Elementary School as well as Keller Middle School, Woolley Elementary School, Edwards Elementary School, and Moore Elementary School.